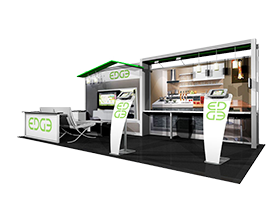 The Eco-Systems Graphic Design and Exhibit Design teams are committed to learning your tradeshow marketing goals and objectives. High-impact display graphics, as well as your exhibit layout, are essential to the process of communicating competitive brand advantages and attracting prospects to your exhibit space. From concept to completion, we will design and custom create an exhibit specifically focused around your company's unique needs. Best of all, we make it easy. One of our most popular services is called "Kit To Custom", where our designers can change and customize any of our standard Kits to better fit the needs of our clients.